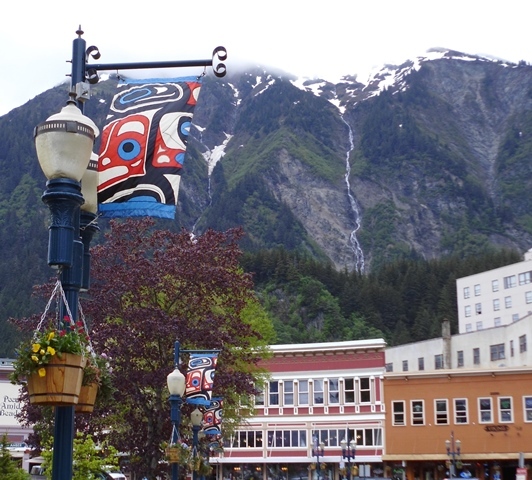 Hello from Alaska’s state capital – Juneau! I so enjoyed my short stay here, seeing old friends, making new ones, visiting with fellow authors, and soaking up some of the amazing history and culture here. A highlight of the trip was a whale watch cruise, organized by the delightful owners of Hearthside Books. As several of us Alaska writers shared our current projects and books, we sipped wine and watched as humpback whales rolled and leapt beside us. I also had a morning on my own, so I explored the marble halls of the capitol building, strolled past the governor’s mansion, and walked around historic downtown with its totem poles and Gold Rush buildings. And then I rode the tram up the mountain. It was foggy and rainy, but beautiful all the same. One of my favorite things about these Southeastern Alaskans is the way they embrace their weather. It’s one way you can separate the tourists from the locals – you might catch a visitor grumbling about the cool, rainy days. But locals respond: “Rainy? It’s just the way we like it!” You don’t see them huddling under umbrellas, and half the time they don’t even wear rain coats. It’s as if rain is as natural to them as air. Most of all, thanks to Deb and Susan at Hearthside Books, everyone at Juneau Public Library, Maggie, Frank & Liz, MJ & Mike, and all the wonderful writers and readers I met on this visit. It was wonderful fun! 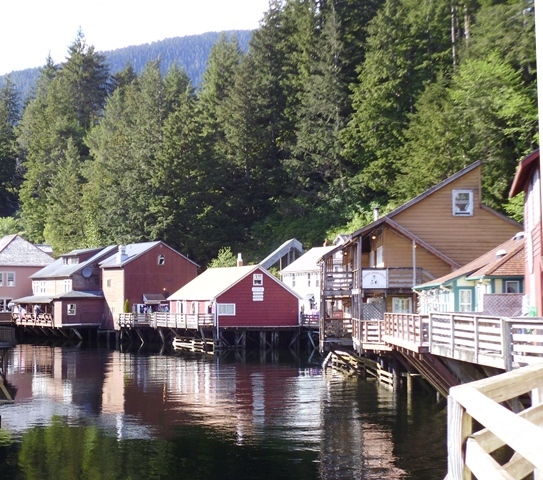 Greetings from lovely Ketchikan! The sun is out, the water is shining, the eagles are calling, and the wild strawberries and salmonberries are in bloom. Here you can see where I stayed in one of NY Hotel & Cafe’s creekside cabins. I’ve had a lovely time with Maggie, Charlotte and all the welcoming people at Parnassus Books and the Ketchikan Public Library these past two days. Thank you all for the hospitality and sharing your beautiful scenery. Next up — the state capital of Juneau. One of the most amazing things about Alaska is its sheer size. 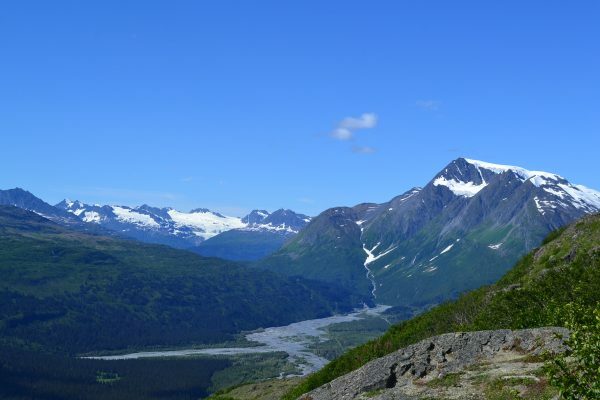 I grew up here, and I have traveled around it quite a bit — from Anchorage to the North Slope, Chicken to Chickaloon, Cordova to Fairbanks, yet there are huge areas I have never seen. Southeast Alaska is one of those regions. For many visitors on cruise ships, this is the gateway to Alaska. But for those of us who live in Southcentral, it can seem very far away. Then I go on to our state capital Juneau where Thursday 7-8:30 pm I’ll be at the Juneau Public Library, Friday 1-2 pm I’ll sign books at Hearthside Books in downtown and then that evening I’ll participate in Hearthside’s Authors at Sea Cruise, which sounds like wonderful fun. For more information and tickets, you can visit Hearthside here. This has been one of the unexpected blessings of the publication of The Snow Child — it has given me the chance to meet booksellers, librarians and readers and to see new parts of the world, even those unexplored lands close to home. You know how you sometimes beat your own postcards home? Well, that is what has happened to me. I’m already back in Alaska, but today is the first chance I’ve had to sit down and write a postcard to you. First let me say that the rumors are true — Deschutes County truly has the most fantastic one community, one read program. For the past 10 years, “A Novel Idea” has featured a book each year that thousands of people read together and then celebrate with programs over the course of several weeks. Past selections include The Kite Runner, The Help, and Rules of Civility. This year they chose The Snow Child, and it was an incredible privilege. This is the only place in the world I’ve been where the community makes a debut novelist feel like a rock star. For the first (and probably only) time in my life I got to see my name on a marquee. I spoke in front of a sold-out house at the Tower Theatre — 500 people. For a book event! Then another several hundred people came to a nearby high school for another event the next day. And the library gets this kind of turnout every year. This is a community that knows how to celebrate books. They sew quilts inspired by the book, they paint paintings, sketch pictures, write lovely bluegrass music — all based on the book of the year. It was a moving experience as a writer to see how others had retold the story through fabric, colored pencils, and vocal harmonies. And most of all I enjoyed getting to know the library staff. In ways, being a writer is a lonely endeavor. There are times that I miss the office banter, the collegial joking that goes on between co-workers. The Deschutes Public Library has the kind of staff anyone would envy, and you can tell they have a lot of fun together even as they work hard. But what was most remarkable was the way they included me, even welcomed me, into their friendship and laughter. For that I will forever be grateful. So to the quilters, artists, musicians, book clubs, readers and librarians of Deschutes County — Cheers! And thank you! P.S. For those of you who know my troubles with homophones, I thought I’d confess that this postcard initially read “my name on a marquis” instead of “marquee.” I guess my name tattooed on a nobleman would be interesting, but I prefer the marquee. I want to let you know about some events I have coming up. This Friday I’ll be in Anchorage at Cyrano’s Theatre Company with Leigh Newman. 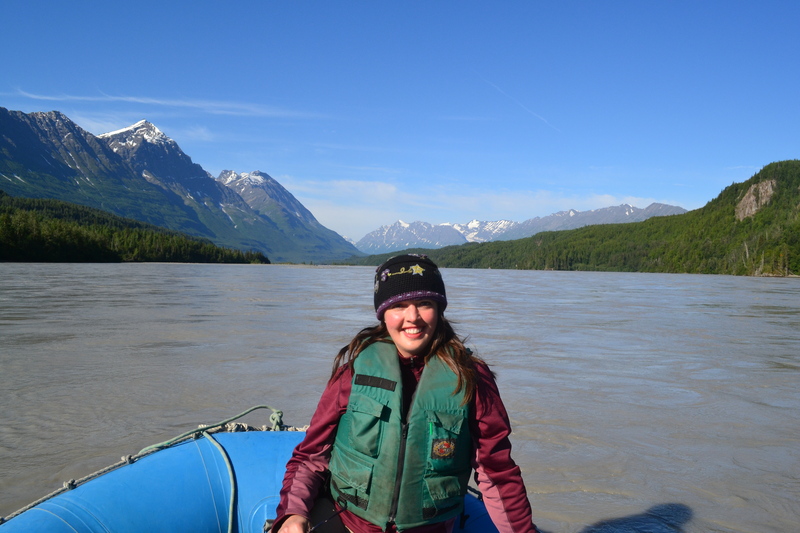 She recently published her memoir Still Points North about growing up in Alaska, seeing the world, and then coming home again. The event is 7 p.m. to 9 p.m. Friday, April 26. Expect a reading from each of us as well as “snacks, fizzy beverages and merriment!” It should be lots of fun. 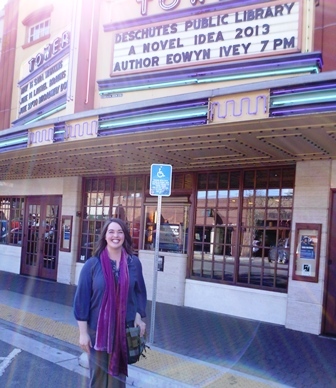 Then next week I head south to Bend, Oregon for Deschutes Public Library’s “A Novel Idea…Read Together.” It has been an delightful honor to have The Snow Child chosen for their annual program. Everyone in the publishing world keeps telling me this is one of the best community reads programs in the country. It kicked off with three weeks of free cultural programs, book discussions, films, food tastings, lectures and art openings. 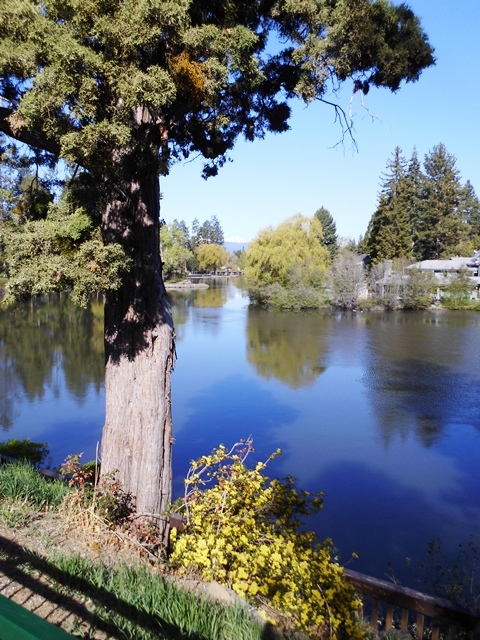 The program culminates with two presentations in Bend. On Friday May 3, I’ll be reading at the Tower Theatre, but I understand these tickets are sold out. However, I’ll also be at a non-ticketed event on May 4th at 11:00 a.m. at Ridgeview High School in Redmond. So whether you’re in Anchorage, Alaska, or Bend, Oregon, I hope you’ll stop by and say hello. Exciting news from London this week — The Snow Child has been shortlisted for the UK National Book Award’s International Author of the Year. The awards dinner, where they will announce the winners, is Dec. 4. So I’m returning to London! You can read more about the UK National Book Awards here. There are several prizes given out, including UK Author of the Year, Popular Fiction and Nonfiction Books of the Year, and New Writer of the Year. All this means I might have the chance to spot someone like JK Rowling, Ian McEwan, Zadie Smith, or Hilary Mantel. I’m not usually one to go ga-ga over celebrities, but famous authors of fantastic books? Well, that’s a different story. And I might also have the opportunity to meet the authors of two wonderful books I’ve read recently — The Unlikely Pilgrimage of Harold Fry by Rachel Joyce and Care Of Wooden Floors by Will Wiles. I hope to see some of you during my travels. Bonjour La Ville-Lumière! And Paris truly is the city of lights. Thanks to my French editor Deborah and her kind husband, we got a driving tour of Paris at night. The Eiffel Tower sparkling into the heavens. 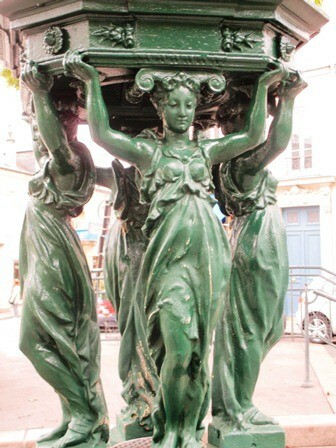 Notre Dame, the Seine, Champs-Élysées, Basilique du Sacré-Cœur, skyscrapers and lush parks — all aglow in the city. It was a truly magical evening. And my amazement has continued. The Louvre, Versailles, corner cafes, the cinema museum, pain au chocolate, street markets, bookstores, designer clothing stores … we have traveled by automobile, metro, train, and foot and still have only seen a tiny portion of all this city has to offer. But as a writer, I found the most unexpected, delightful surprise when I walked into the famous Shakespeare & Company bookstore, an English language literary haven on Paris’ left bank. 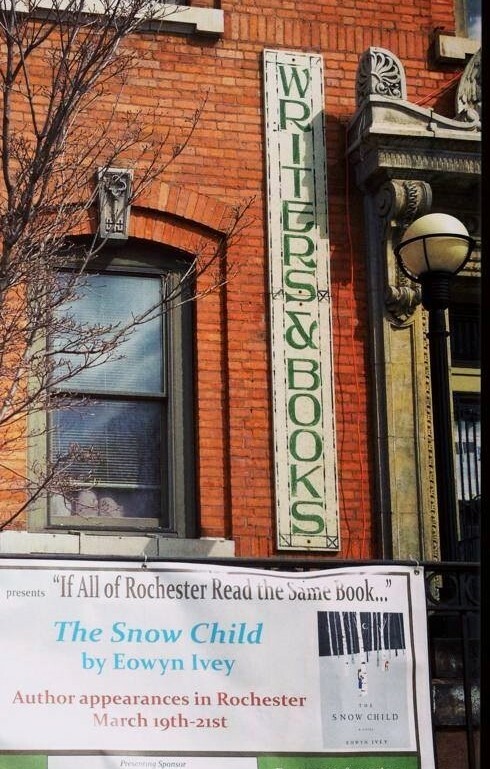 There among the stacks of books for sale was The Snow Child! During the Festival America here in France, fellow American novelist Hector Tobar expressed it so well — with the long, celebrated history of literature here in France, it is truly an honor to be published here. Merci beaucoup to the French translator Isabelle Chapman, the many people with the publisher Fleuve Noir and the French readers, bloggers and journalists who have welcomed The Snow Child to France.